Electric Linear Actuators System for Animatronics Applications | Venture Mfg Co.
Animatronics is an integrative field, which involves mechatronics, anatomy, and robots to bring alive lifelike characters. Since its inception, animatronics has been quite popular in various arts and entertainment industries, such as amusement parks, movies, or infotainment shows. The animatronics project is controlled by various motion control devices, which can be pneumatic, electrical, or mechanical. These devices help create realistic motions and imitate muscle movements with the help of actuators. Venture Mfg. 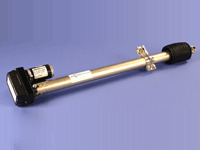 Co. provides automated motion control electric linear actuators for fulfilling a wide variety of animatronics projects. We offer these electric linear actuators at competitive prices. Electric linear actuators have grown quite popular in the arts and entertainment industry, with animatronics being its major beneficiary. At Venture Mfg. Co., we provide the following vast range of automated linear systems, for the animatronics industry. Our actuators not only offer lifelike characteristics to animatronics objects but also help improve the ergonomics. Lifelike Movements: One of the remarkable characteristic traits of our electric linear actuators is that they make animatronic models look realistic and breathtakingly amazing. The animatronic models imitate the genuine motion of different characters to make the onlookers believe it is real. We have different electric linear actuators that are of great use in various animatronics models. Our 800 series acme screw actuators provide smooth, consistent, and repeatable lifelike motion in butterflies, dinosaurs, and various other animatronics models. Some common motions include blink of an eye, movement of limbs, or making a facial gesture. Heavy Applications: Often, heavy animatronic models require swift movement. To address this concern, we provide high speed VI series actuators, which offer durability and robustness. Swift movements are facilitated by actuators through different stroke sizes, forces, and dimensions, and minimum efforts. Realistic than Computer Imagery: Life sized animatronic models offer more natural movement and appearances. These animatronic models can run, and squat or play, which showcases genuine motion in comparison to computer generated imagery. Venture’s 800 series ACME actuators help fulfill character animation or motion capture more precisely and accurately. Various types of body movements, gestures and controls can be easily facilitated by these actuators. Why Choose Venture Mfg. Animatronics based Actuators? Venture Mfg. Co.’s automated motion control devices for animatronics are engineered with advanced features that meet the required design requirements. Our team of engineers and consultants have vast knowledge and expertise to guide our customers. 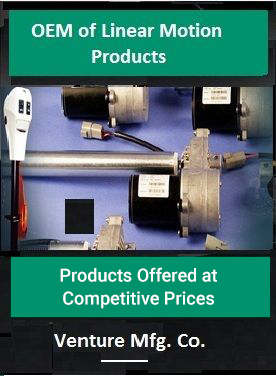 We can engineer customized actuators to meet diverse application requirements of various clients.